Mike Fugate, ham radio operator and member of the Kishwaukee Amateur Radio Club, supervises Brady Hollendoner, a Scout from Troop 40, at St. Mary’s Catholic Church in Sycamore during the Jamboree-on-the-Air 2017 event at Russell Woods Forest Preserve in Genoa. Area Cub Scouts and Boy Scouts recently participated in the 60th annual Jamboree-on-the-Air at Russell Woods Forest Preserve in Genoa. JOTA uses amateur radio to link Scouts and ham radio operators around the world, nation and in their own community. It takes place annually the third weekend in October. The World Scout Bureau reported that the 2016 JOTA had about 13 million Scout participants from more than 30,000 locations, and reached 156 countries. Four Cub Scouts (Webelos) from Pack 339 of United Methodist Church of Waterman, and Pack 173 of St. Mary’s Catholic Church in DeKalb, enjoyed communicating with Scouts from other units in the region on a ham radio station specifically set up for their use. Ten Boy Scouts from Troop 40 of St. Mary’s Catholic Church in Sycamore, Troop 39 of United Methodist Church of Waterman, and Troop 33 of First Lutheran Church in DeKalb all participated by chatting with regional ham radio operators, some of which also had Scouts participating in the worldwide JOTA event. Participating JOTA stations contacted were in Toledo, Ohio; Plano, Waterman and Nevada. 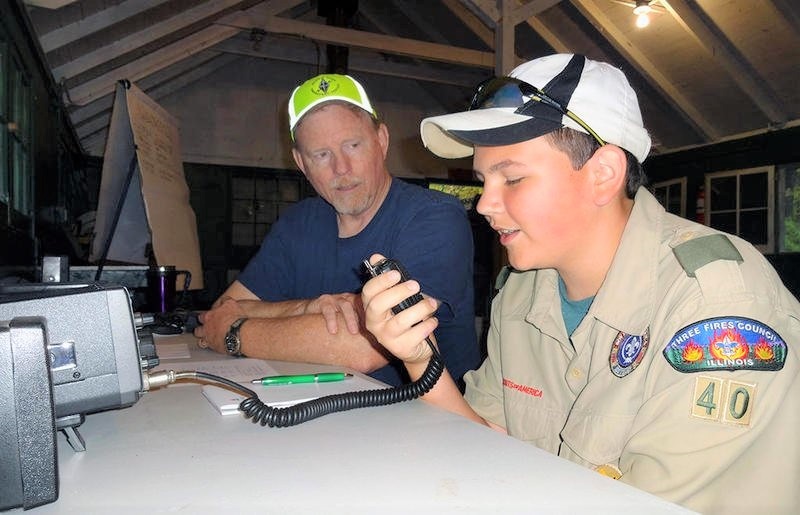 Scouts at the local event earned the Radio Merit Badge, which was taught by Mike Fugate, training chairman of the Three Fires Council, Boy Scouts of America, and a member of the Kishwaukee Amateur Radio Club in DeKalb. Members of the club were instrumental in making the JOTA event an overwhelming success by setting up and operating three amateur radio stations. Robert Yurs, Robert Erickson, Randall Sherman and Mike Tiedt all pitched in to assist the attending Webelos at their own KARC ham radio station. KARC members Mike Fugate, Matthew Braun and Stephen Berg assisted in educating the Scouts and running the ham radio stations. All ham radio stations operated with the KARC call sign WA9CJN.